Netflix freezes, is unresponsive, or gets stuck loading. If Netflix freezes or gets stuck loading, but the rest of your device remains functional, it typically points to information stored on your device that needs to be refreshed. Follow the troubleshooting steps for your device below to resolve the issue. 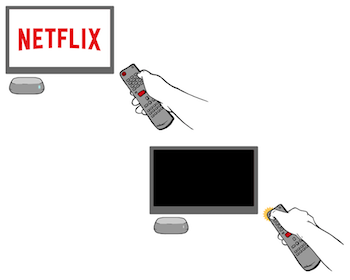 If your device freezes entirely while using Netflix, use this article instead. When does Netflix freeze or become unresponsive? Up, Up, Down, Down, Left, Right, Left, Right, Up, Up, Up, Up. Select Sign out, Start Over or Deactivate. Once signed out, sign back in and try Netflix again. 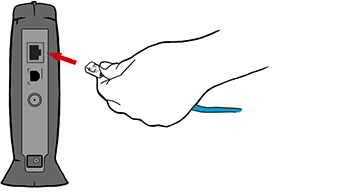 While the device is unplugged, press the power button on the device to discharge it. If you cannot access the power button or your device does not have one, leave your device unplugged for at least 3 minutes. Help upgrading to the latest firmware for the device. Help performing a factory reset. If those steps don't get you streaming again, your manufacturer may have other suggestions for fixing the device. If they don't have additional steps, or the additional steps still don't resolve the issue, you'll need to use a different Netflix-enabled device to continue streaming. Shut your computer down completely and restart it. Select Sign In from the top right corner of the screen. After signing in, try Netflix again. Are you streaming from a cellular or satellite connection? If you are streaming from a cellular or satellite connection, your service may not support streaming, or may not meet the minimum streaming requirements. Please reach out to your service provider for further assistance. If the date and time on your device are significantly different from the current date and time, you will have a problem playing your TV show or movie. For Japanese PlayStations, use X instead of O to cancel the selection whenever O is referenced in the troubleshooting steps below. From the main menu, navigate to Settings. If you're not already at the main menu, hold the PS button in the middle of the controller, select Quit, then select Yes to return to the home screen. Press the O button to return to the Date and Time screen. Unplug your PlayStation 3 from power for at least 1 minute. While your PlayStation 3 is unplugged, press the power button on the console to discharge it. Plug your PlayStation 3 back in. Turn your PlayStation 3 on with the power button. For Japanese PlayStations, use O instead of X to confirm the selection whenever X is referenced in the troubleshooting steps below. Begin from the PS3 Home Screen. If you're not already on the home screen, hold the PS3 button in the middle of the controller, select Quit, then select Yes. Navigate to the TV/Video Services section and highlight Netflix. Immediately after pressing X, press and hold both Start and Select until you see a message asking Do you want to reset your Netflix settings and re-register? Enter your email address and password and try Netflix again. For this step, make sure to leave your video game console and all of your home network equipment unplugged as a group for 30 seconds before plugging each device back in one by one. Turn off or unplug your video game console. Unplug your modem (and your wireless router, if it's a separate device) from power for 30 seconds. Plug in your modem and wait until no new indicator lights are blinking on. 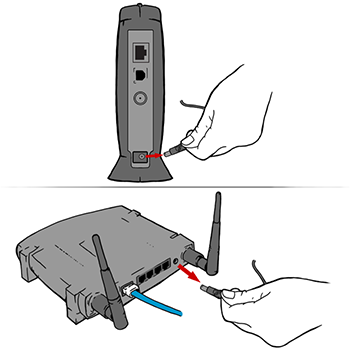 If your router is separate from your modem, plug it in and wait until no new indicator lights are blinking on. 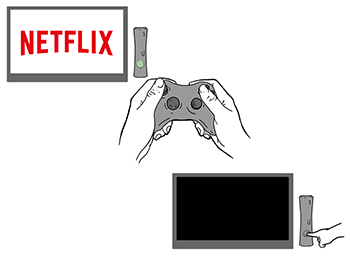 Turn your game console back on and try Netflix again. If the date and time on your device are significantly different from the current date and time, you will have a problem playing your video. Select Set Automatically, if the box is not already checked. Unplug your PlayStation 4 from power for at least 1 minute. Plug your PlayStation 4 back in. Turn your PlayStation 4 on with the power button. Begin from the PS4 home screen. If you're not already on the home screen, hold the PS button in the middle of the controller, select Close Application, then select OK.
Navigate to the TV & Video section and highlight Netflix. Press the Options button on the controller. Deleting the Netflix app will not remove the Netflix icon from your PS4 home screen. Select the Netflix icon. The PlayStation store will launch. Once Netflix has finished downloading, select Start. Sign in to your Netflix account and attempt to stream again. You may be prompted to sign in to your PlayStation Network (PSN) account first. Begin from the Xbox Dashboard. Press the X button for app details. From the Xbox 360 Dashboard, navigate to Apps. Select the Netflix tile to begin downloading the app. Once the download is complete, sign back in and try Netflix again. From the Xbox 360 main menu, select Settings. Select Wired Network or Wireless Network depending on your connection method. If your connection test is successful, continue troubleshooting below. Choose your network and select Configure Network. Select DNS Settings and choose Automatic. Turn your Xbox off and back on. If you need help adjusting this setting, visit Microsoft’s Xbox 360 support site for help. Highlight Memory Unit, Hard Drive, or USB Storage, then press Y on your controller. If you do not see Clear System Cache, check a different storage device. Once you've successfully cleared the system cache, try Netflix again. You may need to scroll down to see this option. Select Apps from the options on the left. 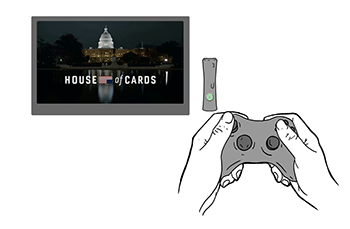 Highlight the Netflix app and press the Menu button on the controller. Select Uninstall All again to confirm. Begin from the Home screen on your Xbox One. Scroll right to access the Store. In the Apps section, select Netflix. If you do not see Netflix, select Search all apps to search for Netflix. Once the app has finished downloading, select Launch to sign in and try Netflix again. Power off your Android phone or tablet by holding down the power button. Confirm that you want to turn off your Android. Press the power button again to power your Android back on. Once your Android finishes turning on, try Netflix again. Unplug both your modem and router and wait 30 seconds. Plug in your modem and wait until no new indicator lights are blinking on. Plug in your router and wait until no new indicator lights are blinking on. Turn on your device and try Netflix again. Move your router to a new location to improve signal strength. You'll usually see better reception throughout your home if the router is in a central location. Move wireless devices such as cordless phones or microwave ovens away from your router. Wireless interference from these devices can create issues when you try to connect over Wi-Fi. Elevate your router off the floor. A router on top of a bookshelf or desk will give you better reception than a router placed behind or under furniture. Attempt to connect to a different Wi-Fi network in range of your device. Bring your device to a neighbor's or friend's house and attempt to stream. If you have the ability to access a cellular data network on your device, try using it to connect to Netflix. While we generally don't advise streaming over a data network as a fix, it's a good way to see if a home network configuration issue is what's keeping you from streaming reliably. If you're able to stream using a different internet connection, we recommend checking with whoever set up your home network to resolve any potential issues with the way the network is configured. After 10 seconds, press the Sleep/Wake button to turn your device back on. Once your device powers on, try Netflix again. Refresh any outdated Netflix information stored on your iOS device by resetting the app. Resetting the app will delete any titles you have downloaded to the device. Swipe down until you locate the Netflix app. Slide the Reset toggle to the On position. Press the Home button twice and swipe right until you locate the Netflix app. Swipe up on the Netflix app to close your session. Press the Home button twice to return to the Home screen. Make sure the issue isn't being caused by an outdated version of the Netflix app by removing it from your iOS device and reinstalling it. Deleting the Netflix app will also delete any titles you have downloaded to the device. You may need your Apple ID and password to reinstall the app once it has been removed. From your iPhone, iPad, or iPod touch home screen, press and hold the Netflix app until it shakes. Tap the X in the top left corner of the Netflix icon, then tap Delete. Once deleted, press the Home button to stop the shaking. Enter the App Store and search for "Netflix." Select the free Netflix app from Netflix, Inc. Tap the cloud icon. You will need to enter your iTunes password to install the app. Once installed, tap the Netflix icon. Enter the email and password for your Netflix account and tap Sign In. You will be prompted for the passcode that was created when restrictions were turned on. Under Allowed Content, select Websites. Specific Websites Only or Limit Adult Content should be selected. Scroll to the bottom of the list and select Add A Website. Enter https://secure.netflix.com along with any title (i.e, "Netflix App"). Select Done on the keyboard. Enter your passcode again to disable restrictions. If Screen Time settings were set up for a child's device you will be prompted to enter your Screen Time passcode before changing these settings. Select Content & Privacy Restrictions. Select iTunes & App Store Purchases. If you have any problems during this process or want to know more about restrictions on your iOS device, visit Apple's support article about Understanding Restrictions. For this step, make sure to leave your device and all of your home network equipment powered off and unplugged as a group for 30 seconds before plugging each device back in one by one. Turn off your mobile device. Turn your device back on and try Netflix again. Press the Home button on your device. Select a different network and connect to it. If you are unable to use a different internet connection, contact your internet service provider for further assistance. Once you are connected, try Netflix again. If using a different internet connection didn't resolve your issue, continue to the next set of troubleshooting steps. If using a different internet connection did resolve your issue, but the new connection isn't your preferred network, we recommend contacting your internet service provider for further assistance. 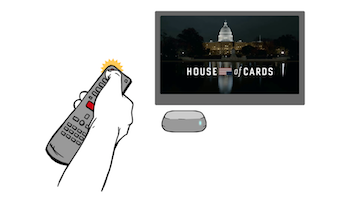 If you have completed the steps above but are still having issues connecting to Netflix, you'll want to contact your internet service provider. They can help you resolve network connectivity issues by determining if your router is properly set up to communicate with the other devices on your home network. Turn the device back on with the Fire TV remote. If you've modified your streaming device for custom connection settings, we recommend restoring your internet service provider's default settings. If you are connecting with a Virtual Private Network, disable it and connect directly with your home internet. If you have changed your streaming device to a custom DNS setting, try resetting the device to acquire DNS automatically. If you need assistance changing your device settings, please reach out to your streaming device's manufacturer. Unplug your Apple TV and the TV it's connected to from power for at least 2 minutes. Plug both devices back in. Turn both devices back on. From the Apple TV home screen, highlight the Netflix app. 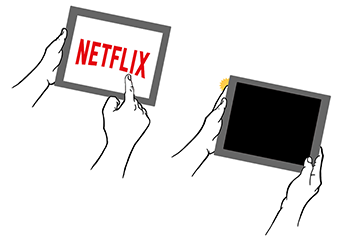 Press and hold in the center of the touchpad until the Netflix icon starts to shake. Press the play/pause button to delete the app. Reinstall Netflix from the App Store and try Netflix again. Double tap the Home button on your remote. Swipe right or left so Netflix is in focus. 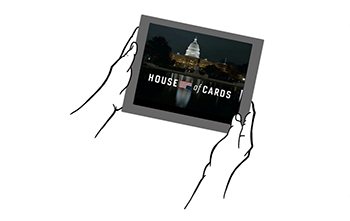 Swipe up to force quit the Netflix app. Press and hold the Menu button on the Apple TV remote until you are taken to the home screen. Wait for the Apple TV to finish restarting, then try Netflix again. Hold the button on the Chromecast for 25 seconds, or until the indicator light begins flashing. Resetting your Chromecast will erase any settings previously saved on the device. Follow Google's steps to reconfigure your Chromecast. Once you have reset the device, reconnect it to your Netflix account. Unplug your Roku from power for at least 10 seconds. Plug your Roku back in. Turn your Roku on by pressing any button on the Roku remote. Press the Home button on your Roku remote to navigate to the Roku home screen. Select Deactivate this player from my Netflix account. Select Yes. The device is now deactivated. Select Netflix from the home screen and follow the prompts to reactivate the app. Sign in to your account and try Netflix again. Highlight the Netflix app and press the star key on the remote. Select Remove channel again to confirm. From the home screen, select Streaming Channels. For this step, make sure to leave your streaming media player and all of your home network equipment unplugged as a group for 30 seconds before plugging each device back in one by one. Turn off or unplug your streaming media player. Turn your streaming media player back on and try Netflix again. If you're connecting through a wireless router that's connected to your modem and still can't connect after restarting your network, try bypassing the router. This will help identify what's causing the problem by eliminating the router or wireless connectivity problems as a possible cause. Turn off your streaming media player. Plug your streaming media player directly into your modem using an Ethernet cable. Unplug your modem from power for at least 30 seconds, then plug it back in and wait until no new indicator lights are blinking on. Turn on your streaming media player and try Netflix again. If you've bypassed your router and successfully connected to Netflix directly through your modem, it's likely that the router itself is the source of the problem. Bypassing the router will allow you to stream for now, but if this configuration isn't a perfect solution, you may want to contact whoever set up your home network for help resetting or re-configuring your router settings. We strongly recommend attempting to connect your streaming media player directly to your modem if you can -- it will allow you to absolutely rule out your wireless router as the cause of any network connection issues. However, if there's no way for you to directly connect your device to your modem, continue troubleshooting below. Unplug your TV from power for at least two minutes. Please note that powering off the TV with your remote or the TV's power button will not resolve the issue. Plug your TV back in and try Netflix again. You cannot reset the Smart Hub if it is in use. Press the Menu button on your remote. Navigate to and select the Smart Hub section of the main menu. This will remove all downloaded apps! If you have downloaded apps to your TV, you will need to re-download them after the reset. If you are unsure how to do this, contact Samsung for assistance. Enter your PIN and press Enter. Your PIN is 0000 by default. If this PIN does not work, please contact Samsung to reset your PIN. If you are getting a black screen, please try Netflix again in 20 minutes. It can take this long for the app to complete setup. Press the Home button on your remote. Select the Settings icon on your screen. Unplug your TV from power for at least 1 minute. While your TV is unplugged, press and hold the power button on the TV for 5 seconds to discharge it. If you cannot access the power button or your TV does not have one, leave your TV unplugged for at least 3 minutes. Plug your TV back in.